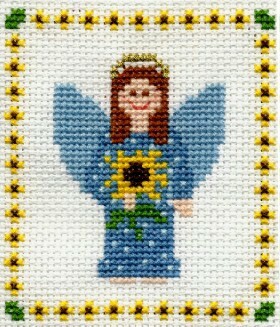 Learn to Cross-Stitch at www.CraftDesigns4you.com! Learn How to Cross-Stitch with this Simple Heart Pattern! If you are new to Cross-Stitch, try this free "Simple Heart" pattern. It will take you step-by-step through the instructions needed to successfully complete your first cross stitch project. Included are many helpful charts that you can print out for your own use. Each symbol or colored square represents one cross-stitch over one square of your Aida fabric that you are stitching on. Your chart will have a key to tell you what floss number and color the symbols or colored squares represent. Looking at the COLOR chart, the RED squares represent DMC floss #304 (Christmas Red Med) and the WHITE squares represent DMC floss White (there is no number for the DMC floss color "White"). Looking at the BLACK and WHITE SYMBOL chart the solid diamond symbols equal DMC floss #304 (Christmas Red Med.) and the plus symbols equal DMC floss White. Before you start your project, you need to first determine where the center stitch on your chart is, so that you can center your design on your fabric. The cross-stitch chart will have 2 arrows on the top and left side edges. When you follow these arrows straight into the middle of your chart, you will find the center stitch where they intersect. (It helps if you circle this stitch on your chart.) In this heart chart, the center stitch is made with red floss. Now, to find the center of your fabric, fold your fabric in half from top to bottom and then from side to side and pinch the middle with your fingers. This center on your fabric is where the center stitch on your chart will go. NEVER KNOT your floss. When you stitch, insert your needle from the back of your fabric and leave a 1 inch tail in the back. Hold this tail behind your fabric with your left hand and stitch over this tail while you make your next several stitches with your right hand. When you have finished stitching, weave the end of your floss through the stitches on the back side of your fabric. Cut the floss close at the end, and remember, you do not make a knot. Come up with your needle from the back of the fabric at A. Then go down with your needle from the front of the fabric at B. (This makes half of your cross-stitch). Next, come up from the back of the fabric at C, and then go down at D.
With each cross-stitch that you stitch, make sure that the top stitches (C to D) are always going in the same direction. As you stitch, the floss may get twisted, so after you make several stitches, let your needle dangle to untwist the floss. If you prefer to use an embroidery hoop while stitching your project, make sure to take it off the fabric when you are not stitching on it to prevent marks. 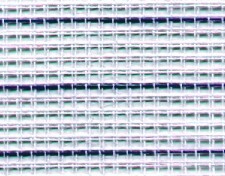 Cross-Stitch Fabric comes in 2 basic types: AIDA (photo shown at the left) and EVENWEAVE (photo shown at the right). Aida fabric has actual squares woven into it - so you are stitching your cross-stitches right over the squares. Evenweave fabrics are like fine linen cloth - you have to stitch your cross-stitches over 1 or 2 threads of the fabric to make your "squares". Cross-Stitch Fabrics also come in different "COUNTS". 14-count Aida is the most popular. The count refers to how many squares or threads there are in the fabric per inch - thus 14-count means there are 14 squares per inch. Other popular Aida counts are 11-count, 16-count and 18-count. Evenweave Fabrics go by a slightly different "count" - for example, 28-count Evenweave Fabric is what you would use to stitch a 14-count design - because you would stitch your cross-stitches over 2 threads thus creating a 14-count design. So if you wanted to stitch a design on Evenweave Fabric that would be equivalent to 11-count Aida you would need a 22-count Evenweave Fabric. **If you are just beginning, we highly recommend using 11-count Aida Fabric - it has larger squares and so is easier to stitch on. If your project calls for evenweave or linen fabric, you may be unsure of the count of this fabric or the instructions that say to stitch "over two threads". Unlike Aida fabric, which already has the "squares" to stitch over, evenweave has only the "threads" showing. Therefore, you will be stitching your cross stitches "over two threads" which means you pull your thread up through a hole and then count two threads (up or down depending on the direction of the stitch you are making) and put your thread down the next hole. The count of evenweave fabric is double the count of aida fabric. So for instance, if you want to stitch a 14-count pattern, you would need to use 28-count evenweave fabric. You can stitch a cross stitch pattern on any count or type of fabric that you want - just keep in mind that you will need to figure out the final dimensions based on which size count you stitch on - so that you use a big enough piece of material. Floss comes in 6-ply. This means there are 6 separate strands or plies in the floss. You need to separate these strands and then use the right amount to stitch your stitches. **TIP: Run your length of floss (18" is a good length) through a damp sponge before separating the plies - this will keep the strands from twisting and getting knotted up as you separate them. Most patterns will tell you how many strands/plies you need for each type of stitch. Cross-Stitches use the most strands, and Backstitches and French Knots use fewer strands within the same pattern. The reason for this is that the Backstitches are used for outlines and details that are stitched after your Cross-Stitches and would be too thick against your Cross-Stitches to create an artistic effect. The same applies to French Knots. Most Cross-Stitch patterns will give you the dimensions, in width and height, of the amount of stitches in that particular pattern. For example, my "Simple Heart" pattern is 9 w x 8 h. This means there are 9 stitches across/wide and 8 stitches long/high. If a graph doesn't tell you the dimensions, you simply count the squares on the graph from the edges of the pattern itself to get the same dimensions. Now, here's the sometimes confusing part: When you stitch the same pattern on differnt sized fabrics, you will have different sized completed projects of the same picture. Each picture will be exactly alike, except for the size. So, if you stitch this "Simple Heart" on 11-count fabric, it will be larger than one you stitch on 18-count fabric. Knowing the dimensions of a pattern you want to stitch is important, because it helps you determine the size of fabric you want or need to use. For example, if you want a picture to fit in a certain size frame, you have to make sure the finished size will fit that frame, and so may have to use a larger or smaller sized fabric to accomodate that. In the case of this "Simple Heart" pattern, if you stitched it on 11-count, the largest fabric in this example, the finished size would be 3/4" wide x 5/8" high. Stitched on 14-count fabric, the finished size would be 5/8" wide x 1/2" high. Stitched on 18-count fabric, the finished size would be 1/2" wide x 3/8" high. These sizes are not so dramatically different, but a larger pattern can make a big difference! The following chart shows you the finished sizes (in inches) for the different fabric counts. **TIP: We recommend using a Cross-Stitch ruler which has the popular sizes of fabric on it along with the stitch counts, per inch - you can refer to this 12" ruler to determine the different sizes your finished picture will be, and you can also use it to count the squares on your fabric. Waste Canvas is used when you want to stitch a cross-stitch design on some material that isn't made of evenweave or Aida fabric - such as a Sweatshirt or T-Shirt. Waste canvas comes in differnt sizes like the Aida cloth - so make sure that your finished design will fit on the area you want to stitch. Based on the size canvas you choose, you will need to decide how many plies of floss to use. You will probably need to experiment with different plies on your particular piece of material. What you are looking for is enough plies to cover so that the material is not showing through too much behind your stitches (particularly important if your material is dark), however you also want to make sure that your floss isn't too thick to pull comfortably through your material or too thick to lay flat against your material. * Use a sharp-ended needle (instead of the usual tapestry needle) when stitching with waste canvas on material - this will help in piercing your material to stitch on. Baste the waste canvas (and interfacing, if you are using it) to the material that you are stitching on with regular thread. It is important to be sure of the center stitch on this design so that it is placed where you want it to be on your shirt or material. Stitch your design making your stitches go through both the waste canvas and your material. If your material is an article of clothing, you may want to weave your beginning and ending tail ends of floss through longer areas to make sure they won't come out during washings. When you are finished stitching your design, wet the waste canvas with water (a spray mister is good to use) and pull out the waste canvas threads, one at a time, starting with the outer edge ones and working toward the center ones. Tweezers help! Also, if there are long sections of the canvas and you can cut through them, around your stitches, to help in pulling them out - be careful not to cut through any of your stitches though! Care for your article of clothing that has been stitched on is similar to the normal washing and drying instructions for the clothing itself. The floss is very durable. You may wish to turn your article of clothing inside out while washing and drying so that the front part of the stitching receives less friction. If you are concerned with the floss bleeding, you can always wash in cold water. If the floss colors do bleed onto your material, continue to rinse in cold water, until the bleeding is removed. Bring your needle and thread to the front of the fabric (like you do when you are beginning a cross-stitch) at the place where the french knot is to be. Wind your needle twice, around the base of the thread (where it is coming out, close to the fabric). Now, with your other hand holding the thread close to where you just wound the needle, slowly bring your needle back down through the same space you came up through. Holding the thread somewhat tightly as you do this will keep the knot nice and prevent it from tangling. Continue to pull the needle all the way through the back until the knot is complete. If you pull a little too tightly, the knot will sometimes pull through the hole to the back instead of staying on top. If this happens, just make another french knot (don't bother trying to untie the previous knot). A "trick of the trade", if you still have problems with french knots is to substitute seed beads for french knots. The most popular manufacturer is Mill Hill They have instructions in their "tips" page about sewing beads onto your fabric. Basically, you can find a similar color seed bead to stitch onto your project that matches the color of the french knot you will be replacing. You come up through the fabric where your french knot would be (use only 1 strand of matching floss for this - 2 or 3 plies/strands of floss would be too thick). Put your bead on your needle and string it through the length of the floss. Bring your needle back down through the same hole of the fabric where you started, pulling the bead tight against the fabric - making sure that your floss doesn't twist and tangle as you do this. If you can't find the Mill Hill brand beads in your local craft store you can often find other brands of seed beads in little plastic bag packs - often in multi-colored assortments. Always make sure to cut your fabric large enough - you want to leave a border of at least 4 inches around ALL SIDES of your pattern. So, if your pattern's finished size is 5 x 7, cut your fabric to a size of at least 13 x 15 (that's 4" on each side). It is always better to have extra fabric on the edges, you can always trim them down, afterwards, and if you have miscalculated your stitching, you may end up with not enough fabric to complete your design. Consider also, that if you have your project professionally framed, the way the framer will prepare your project is by wrapping the edges of the fabric around a foam board and anchoring it with pins. This means you need enough fabric to wrap around the foam board as well as some fabric left as a border between your stitches and the frame. Almost all pictures have a "border" of unstitched fabric around them - otherwise the mat or frame would come up against the actual stitches, with no border of background fabric showing. Visit our Shops for fun and easy Cross Stitch Patterns!